Cut out the middleman and save where it counts. Our integrated supply chain and manufacturing infrastructure cut costs without cutting corners, giving you OEM quality without the OEM price tag. 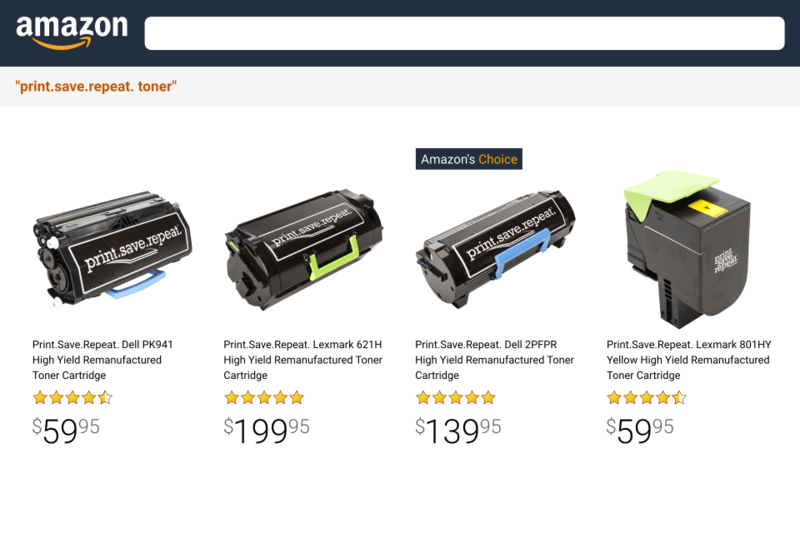 The best-rated toner cartridges on Amazon. Print.Save.Repeat. remanufactured cartridges have more authentic positive reviews than any other toner brand and are often featured as Amazon's Choice. Custom labels tailored to your business. Whether you need consistent branding, resistance to harsh environements, or accurate barcode scanning, create the perfect label that's right for you. Thousands of businesses can't be wrong. Print.Save.Repeat specializes in helping brands optimize their printing supplies to spend less, print better, and help the environment all at the same time.